It’s the strongest FDA-approved brain imaging device available. Last year, Brigham and Women’s Hospital (BWH) installed a 7.0 Tesla (7T) Magnetic Resonance Imaging (MRI) scanner—the strongest FDA-approved brain imaging device available, and the first of its kind to be installed in a space used for routine patient care. Housed in our new Hale Building for Transformative Medicine, this state-of-the-art imaging technology will show the details of the brain structure and brain disease in unprecedented resolution and serve as a critical resource for our researchers in the Ann Romney Center for Neurologic Diseases. 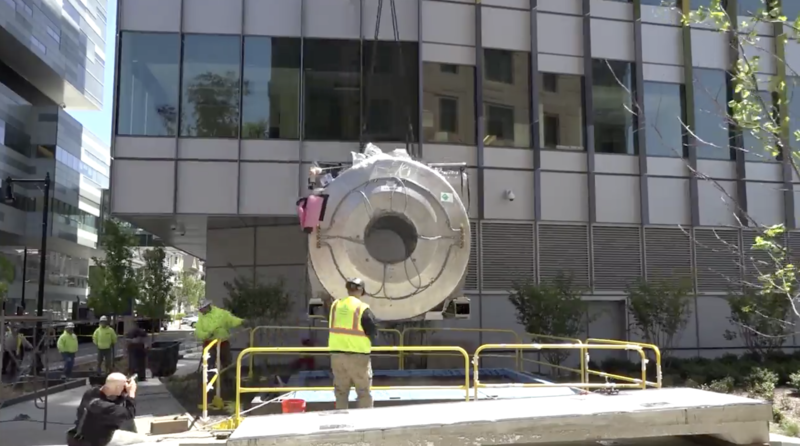 Weighing almost 25 tons, the 7T is more than double the strength of the current state-of the-art 3T MRI scanners that are now widely used for research and patient care. The higher field strength means a better signal and higher-resolution images of brain structures and irregularities, as well as the musculoskeletal system. When cleared by the Commonwealth of Massachusetts, the 7T at BWH will be the most powerful MRI scanner available for patient use. In the fall of 2017, the 7T was lowered by crane into the Hale Building for Transformative Medicine through a specially designed access hatch to a loading platform below. It was then moved through a hold, and slowly pushed down the service corridor, a process that took several hours. The Hale Building for Transformative Medicine, which opened to patients in October 2016, is designed to accelerate the translation of science into the clinical setting and bring cutting-edge innovation and treatments to patients. The building includes an imaging floor especially designed and constructed to accommodate installation of new imaging devices, including the 7T, and allows for efficient removal of MRI equipment for upgrades and repair.